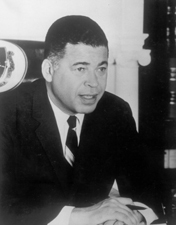 BROOKE, Edward William, III, a Senator from Massachusetts; born in Washington, D.C., October 26, 1919; attended the public schools of Washington, D.C.; graduated from Howard University, Washington, D.C., in 1941; graduated, Boston University Law School 1948; captain, United States Army, infantry, with five years of active service in the European theater of operations; chairman of Finance Commission, city of Boston 1961-1962; elected attorney general of the Commonwealth of Massachusetts in 1962; reelected in 1964; elected as a Republican to the United States Senate in 1966; reelected in 1972 and served from January 3, 1967, to January 3, 1979; unsuccessful candidate for reelection in 1978; first African American elected to the Senate by popular vote; lawyer; awarded the Presidential Medal of Freedom on June 23, 2004; awarded the Congressional Gold Medal on July 1, 2008, for recognition of his service to the nation; was a resident of Coral Gables, Fla, until his death on January 3, 2015; interment in Arlington National Cemetery, Arlington, Va.
Office of History and Preservation, Office of the Clerk, Black Americans in Congress, 1870–2007. Washington, D.C.: U.S. Government Printing Office, 2008; Brooke, Edward. Bridging the Divide: My Life. New Brunswick: Rutgers University Press, 2007; Brooke, Edward. The Challenge of Change: Crisis in Our Two-Party System. Boston: Little Brown, 1966; Cutler, John Henry. Ed Brooke: Biography of a Senator. New York: Bobbs-Merrill Company, 1972.